The Funny of Love. note Pictured: Sedine and Sam. 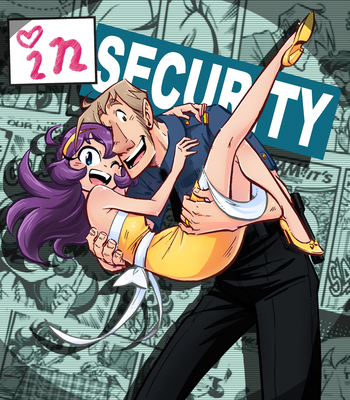 InSecurity is a Newspaper Comic Strip created by Bea R. and it premiered on Jan. 02, 2017. It concerns two newlyweds, Sam and Sedine Kilgarriff, who live in the suburban town of Knightville, North Dakota and the situations they find themselves in due to their differing personalities. Sam is a rather laid back sort while Sedine has a more outrageous personality. This strip has NOTHING to do with the tv series with the similar name. The strip can be found here . Now has a Wiki. Check it here. Animesque: The look of the strip seems like it came right out of a manga series, from wild-looking Anime Hair, Alertness Blinks, Big Ol' Eyebrows, and Visible Silence, to most other Japanese Visual Arts Tropes. As if to hammer the point home, the phrase "onii-san" even makes an appearance. Attractive Bent-Gender: A 2018 series of strips has Sedine disguise next door neighbor Ellie Gardner as a man. Sure enough, a whole bunch of women fall for him. Sedine's cousin Roy Buxton has a wife named Charlene whose Button is whatever doesn't fit her definition of normal. Betty and Veronica: Sedine sees herself as the Betty to Ellie's Veronica for Sam's Archie. Good thing for Sedine Ellie is such a ditz. The Big Guy: They dont come any bigger than Hank Hubble Durum, aka Hubbs. Big Ol' Eyebrows: Roy sports these and his baby daughter Gabby inherited them. Bruiser with a Soft Center: Big, burly Hubbs who gets flustered and nervous around pretty girls, in particular Ellie. Cannot Spit It Out: Hubbs is attracted to Ellie but he is unable to tell her so due to his being utterly nervous around women. Cheerful Child: Micha, the eldest of Roy and Charlene's two daughters, is rather cheery in contrast with her baby sister Gabby. Clingy Jealous Girl: Sedine may be unashamed of showing off her goods to get men drooling, but heaven help any woman she sees as a threat to her marriage to Sam (who generally reacts with exasperation at her paranoia). Sedine's reaction to the fact that Ellie, who's renting the house next door, had once dated Sam in college has to be seen to be believed. Such as Sedine's jealousy that she becomes paranoid that Gabby, a toddler, is going to steal Sam from her, based on her first word being "SAM!". She justifies this by claiming that Gabby will simply wait until she is 18 to pounce on Sam. Cloudcuckoolander: Sedine has an odd way of seeing things. Cute Kitten: Sedine found a cat she named "Ow" ("Me-OW!" "See?! You - Ow!! Me Sedine, He Sam! )(note Sam: Uhg.). But he turned out to be Ellie's cat (Long story! ), whose real name is Sir Pinky-Paw III von Cuteland am Rhein. Cuteness Proximity: Sedine just can NOT resist anything she sees as adorable. Case in point, this strip which introduced the aforementioned cat. The Ditz: Ellie isn't exactly the sharpest tool in the shed. Never is this more apparent than in her "relationship" with Hubbs - she has no idea that he thinks she's a man named Al (and he has no idea that she's the same waitress around whom he becomes a gibbering nervous wreck), and simply believes he's saving himself for marriage when he ignores or rebuffs her attempts at affection. A Dog Named "Dog": The co-creator and Bea.R's husband has the pen name "Mr. Husband". The Dreaded: Hubbs starts out as this. Evil Eyebrows: Gabby, the youngest of Roy and Charlene's two daughters, has this sort of eyebrows. In fact, it's because of these that Sedine sees her as evil. Fetish: Charlene has one for handlebar mustaches , to the point that Gabby was conceived when Roy re-grew his after having previously shaved it off. Upon hearing this, Gabby wishes she had some Brain Bleach handy. Gag Nose: Both Sam and Roy sport rather prodigious probosces. Genki Girl: Sedine is very excitable, much to Sam's dismay. Gonk: Gabby, Roy and Charlenes youngest child, is not the cutest baby around, possessing a unibrow, a hairstyle that looks like devil horns, and a perpetual scowl. This has not stopped her from establishing a career as a toddler model. Hemisphere Bias: Averted. One shot of the Earth centers mostly on Asia. Or maybe just Japan. Huge Guy, Tiny Girl: Sam is the Huge Guy to Sedine's Tiny Girl. When Sedine asked Sam about what their Spirit Animal forms would be like, he saw himself as a quiet St. Bernard and Sedine as a yapping Chihuahua. There's also the imagine spot that has Sam and Sedine imagining clones of the other. Sedine imagines a bunch of Sams pampering her, while Sam imagines a bunch of Sedines fighting over him. Mama's Boy: Hubbs is very much this. Considering the fact that Sedine is hardly mature, she is very much a Woman Child. This is one of Roy's defining character traits. When Charlene takes the kids to visit her mother, Roy almost immediately reverts to the intellectual and emotional level of a five-year-old, including sticking a fork into an electrical socket (because he can't remember why it's a bad idea), then interrupting Sam and Sedine's date night screening of Casablanca to demand that they entertain him (after which he becomes The Thing That Would Not Leave - so Sam and Sedine leave instead). When Charlene insists that he cut his mullet, he charges into Sam and Sedine's house, climbs onto the top of a door as if it were a ledge, and refuses to come down, even saying "You can't make me!" Charlene's anger is further stoked when Gabby hands Roy her bottle and he keeps drinking from it. Mistaken for Gay: Sams parents regard the relationship between Ellie (as Al) and Hubbs with pride. Motor Mouth: As Roy tells Sam, ever since his elder daughter Michaela learned to talk, she hasn't stopped for a moment. When he tries to read her a story, she interrupts with questions after every sentence. Naked Apron: This strip shows Sedine sporting this, but the only thing on Sams mind is the prospect of baking a cake. New-Age Retro Hippie: Sam's parents are stereotypes of the militant far left, vehemently opposing anything capitalist or potentially environmentally damaging and expressing their disappointment that Sam didn't go to college and identifies as a heterosexual, cisgender male. Sam finds them embarrassing, and Sedine's arch-capitalist mother despises them, so sparks always fly when both sets of parents visit for Thanksgiving. Older Than They Look: Sedine is twenty two, but can easily pass for sixteen. Only Sane Man: While Sam DOES have his quirks, compared to Sedine and her cousin Roy, he's the voice of reason. Perpetual Frowner: Gabby has never been shown to smile once. Shrinking Violet: Charlene can be rather shy when shes not being obsessed about normalcy. Shotgun Wedding: Roy and Charlene's wedding, with a heavy emphasis on "shotgun" . The Shut-In: Charlene DESPISES the idea of being outside. Sedine tries to get her out to spend time with her. It went about as well as you'd expect. That is, not at all. Statuesque Stunner: Ellie is taller than Sedine, a fact that Sedine is none too pleased about. Stepford Smiler: Sedine's father, in total contrast to her money-obsessed tirade factory of a mother, does his best to grin his way through their family gatherings, especially at Thanksgiving when his wife gets into screaming matches with Sam's New-Age Retro Hippie parents. Sweet Polly Oliver: Ellie, or rather, Al, becomes Hubbs football teammate. Tiny Tyrannical Girl: Despite being the shortest character in the strip no one can argue Sedine is in charge. You Gotta Have Blue Hair: Sedine's hair is purple.